Congestion Basing Can Present Incredible Opportunities – Technical Traders Ltd. In true technical analysis theory, price tells us everything and indicators assist us in relating current price movement/action to historical price movement/action. 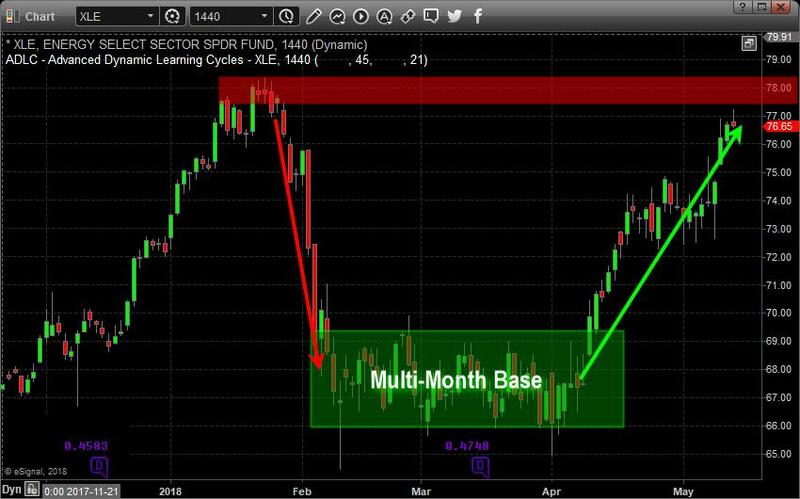 This simple chart illustrates how price setup a top/resistance zone near $78 in early January 2018, broke lower in early February, then setup a multi-month price support base for nearly 60+ days. This price support base because an extended bottom formation and a “price support zone” by testing and retesting the critical $65~66 price level while establishing a series downward sloping high price peaks. When it finally broke free of this support zone, near mid-April, price skyrocketed higher (+17% or more). With the stock market showing all the signs that it is in the late stage of a bull market this is when traders need to start identifying the hot sectors or high probability continuation patterns. Why? because we have entered a stock pickers market. It’s simple really, it means all the stocks are not going to be rising together and if you put your money into the wrong sector you could lose money while the markets rise. So where is the next hot sector? we believe a very similar pattern is setting up in the IYT (Transportation Index) just like we saw on the first chart of the XLE. We feel an upside breakout move is likely to happen within the next two weeks. 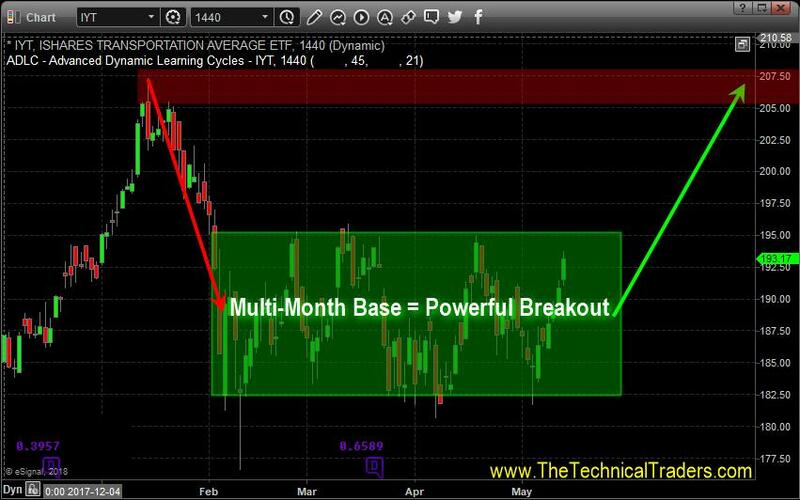 The setup of this price pattern is a bit broader and more volatile than the XLE Multi-Month Basing pattern – which means the IYT upside breakout could be more volatile and dramatic in form (possibly driving price +10% to 20% over an extended period). Additionally, the high price peaks are setting up in a similar format with lower high price peaks over the span of the base. Support near $182.50 to $185 is critical and we believe the eventual upside breakout will be an incredible opportunity for traders. This breakout will coincide with much of our other analysis of the US major markets which we have been sharing recently. Our other recent trade alerts, that are up well over 10% each are UGAZ, FAS, and TECL. These have been rocketing higher – as we predicted. On Friday we closed our TECL position which hit our resistance level and we locked in the 18.3% gains with our members. The single point of success for all of us is to manage our assets well in an attempt to achieve greater long-term success. If you have not seen or read much of our recent analysis, please visit www.TheTechnicalTraders.com to learn more and review our work. Our exclusive members are already positioned for many moves like this in the markets and more continue to form each week. We urge you to consider joining our Wealth Building Trading Newsletter as a member to receive our incredible insight, proprietary research, and trade alerts to assist your own trading success. We have delivered insights and research to our members that have clearly informed them of where we believe the markets are headed for many months in advance. Imagine how powerful that kind of research could be for you?